Sunny Central Hideaway-Close to UCCS-GOG's with Spacious and private floor plan! Awesome Open Concept to Enjoy Family and Friends. Easy to Entertain Main/Ground Level private Living area Gorgeous, Peaceful, Centrally located Springs Home Queen Bedroom with walk out to the backyard patio Walk Out the Main/Ground Floor bedroom to this cozy patio and enjoy a cup of coffee Relax and read a book or watch some TV Kick back and Relax in the comfort of this private lower level suite. Main/Lower Level Bathroom with large Shower Plenty of Seating to enjoy friends and family Fully Stocked Kitchen-Enjoy Some Home Cooked Meals Enjoy Friends and Family on the deck or throw down some BBQ Master Bedroom with King and En-Suite Bathroom Master En-Suite Bathroom Bedroom 3 With a Queen Not 1 but 3 bathrooms in this home This one is the upstairs guest bath. Plenty of room in this 4th bedroom with Queen Bed. Large Nicely Manicured Back Yard. Welcome to your beautiful central hideaway! You couldn't ask for a better location to visit the Springs! 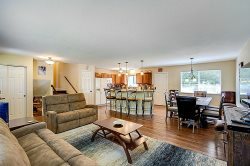 This quiet, bright an open home is just minutes to UCCS, GOD's, downtown, I25, Air Force Academy and much more! The moment you walk in you will feel right at home! This quaint abode easily sleeps 8 people. Entering through the front door you will walk into a cozy lower/ground level suite with a bedroom that has a Queen, 3/4 bathroom and living area. Walk out the bedroom to a private patio in the immaculately cared for back yard. As you walk up stairs you enter into a large open concept kitchen and living room. Relax on the sofa or hang out in the kitchen as you entertain with family and friends. Exit out the kitchen to the upper deck and sit around the patio table and have a drink and/or whip up some BBQ on the grill. There are 2 more bedrooms on this level. The master bedroom boasts a King bed and an en-suite 3/4 bathroom. On the other side of the house is a 2nd bedroom with a Queen and another 3/4 bathroom and laundry room.